The Slovak people have elected their first female president: Zuzana Čaputová, a 45-year-old lawyer, activist and divorced mother of two daughters with staunchly liberal leanings. By voting her into office, the smallest Visegrad country has decided to swim against the current of right-wing populism in Europe, giving hope to supporters of liberal democracy in the region. However, the country is still divided into two isolated worlds. If Čaputová wants to meet the expectations of the liberal democrats, she needs to ease tensions between these two enemy camps and bring them together. She won the election by being relatable; a flesh-and-blood woman. That is who she is, but that is also why the expectations of her supporters may be overly optimistic. Some Slovak citizens live in a globalized European Union of the 21st century – without geographical, economic, religious or cultural borders. However, a significant percentage of Slovaks have settled in a sovereign, self-contained, national state whose power comes from God Himself. Such a country has never actually existed; it is purely a fantasy concocted by romantic, ultraconservative, Catholic nationalists with the help of cynical players from the Kremlin, whose intentions cannot be accomplished without a fragmented Europe. Zuzana Čaputová built her campaign on a platform of liberal democracy, Western values, authenticity, sincerity and decency. She refused to use calculated political marketing. In pre-election debates, she only shared her personal convictions. Her campaign was non-confrontational, avoiding personal attacks, despite the fact that she was personally attacked herself. She persisted in speaking openly about her liberal values and never promised anything she did not truly believe she could accomplish. This strategy was what brought her success. Čaputová’s rival Maroš Šefčovič, an experienced diplomat with a good reputation and the European Commission Vice-President, needed to distinguish himself from Čaputová. He had no other choice than to bet on populism. Although he labeled himself as an “independent” candidate, he was the de facto candidate of former prime minister Robert Fico, who is desperately trying to regain the power he lost. Since Fico stepped down last year, he has been gradually losing influence over many important institutions. SMER – SD, Fico’s ruling party, has lost more than a third of its voters since his resignation. Every week, there seems to be a new scandal pointing to his party’s corruption. Smer – SD is too weak to get its candidate into the presidential palace of its own accord. In order to succeed, Šefčovič needed to woo voters away from two anti-establishment candidates in the first round of voting: Marián Kotleba and Štefan Harabin. Their joint support in the first round, around 25%, was surprisingly high. Trying to persuade establishment voters to elect a diplomat from Brussels was an inauspicious plan to begin with and most of that 25% stayed home on the Voting Day. The political battle lines in contemporary Slovakia have not been drawn between right-wing and left-wing or conservative and liberal; a significant percentage of conservative voters actually cast their ballots for Čaputová. The current political gulf lies between democracy and its self-proclaimed “anti-establishment” opponents. The reason for this divide is the long-standing misconception that the Slovak system of government is a “Western-type” liberal democracy. However erroneous that misconception is, it must be acknowledged that Slovakia does still operate on a political system of institutionalized corruption, which was established by the anti-Western Mečiar-government in the nineties. The reform governments that brought the country to NATO and the European Union upgraded it to a version that was more compatible with European standards, but it’s like trying to connect an Android smartphone to a Windows laptop—it sometimes work, but not reliably so. Fico debugged this system to the point where it ran for a while without serious issues, and, for a decade, many Slovaks believed that they were living in liberal democracy, which is why they are now so disappointed in democracy and the West. The essence of the current Slovak political system was perhaps most accurately described by sitting president Andrej Kiska when he called it a “mafia state.” After the murder of investigative journalist Ján Kuciak, it became clear that many key government institutions were under the direct influence of ordinary criminals. There is practically no party in the Slovak parliament that represents any real political values. So-called “fascists” are the only exception: they sincerely desire to fulfill the ideology of the first independent Slovak state—a fascist puppet state created by Adolf Hitler during WWII and run by Catholic priest Joseph Tiso. Most other parties consist of opportunists seeking to promote their personal economic interests who have merely happened upon an available political logo. This is why it’s possible for Slovakia to have a liberal party whose agenda is to protect the nation from Islam, migration and the homosexual threat to the traditional Christian family values of the Neo-Marxist West. Social democracy, in turn, seeks to protect the motherland from Islam, migration and the homosexual threat to the traditional Christian family values of Western liberalism. They are all clamoring for their share of the same political market that is already dominated by the much more straightforward fascists. 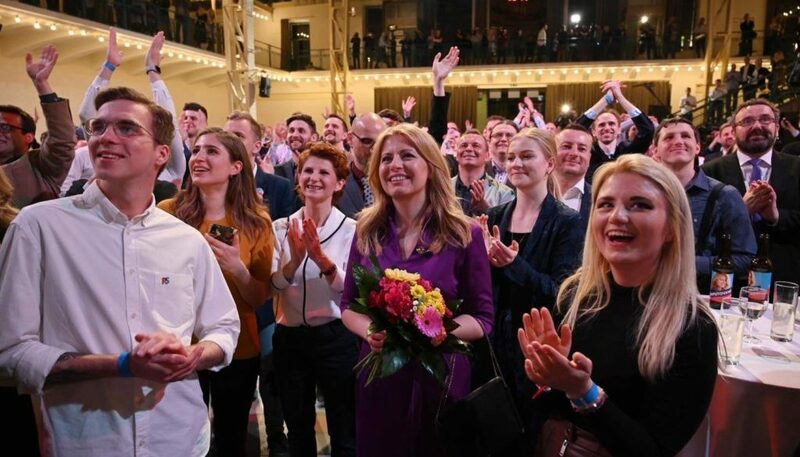 When the new “Progressive Slovakia” party appeared on the scene with its apolitical, citizen-activist roots, it showed that a significant amount of voters would support a pro-Western and liberal alternative, were it offered to them. It is by no means an overwhelming majority, but with the fragmentation of the populists, it could arise victorious. The first sign of success was at the regional elections in the autumn of 2018. Čaputová was the deputy chairman of the party at the time. The approval of Čaputová was around 9% in January 2019, which pointed to a 5th-place finish for her candidacy. One month later, she was leading the primary election polls, thanks to two of her opponents—one intentionally, one unwittingly. Conservative candidate Robert Mistrík, a Slovak scientist and entrepreneur with a powerful personal story, had already resigned in favor of Čaputová before the first round of the election. When the primary polls showed that Čaputová’s chances of winning were higher, Mistrík bowed out of the race, so as not to split the democratic vote. This is unprecedented in Slovakia, and Mistrik became one of the heroes of the presidential election. Without his personal sacrifice, the final battle would have looked very different. Šefčovič also helped Čaputová to win, although it was hardly his intention. If he had not run for the presidency, she would almost certainly have stood against the anti-establishment candidate Harabin in the second round. Harabin would likely have been more popular amongst Fico’s social democratic supporters than Šefčovič was with anti-establishment voters. Voter turnout would probably have been higher, which could have resulted in a very different outcome. However, there are no “ifs” in politics—only the result matters. The next president of Slovakia will be Zuzana Čaputová, who has already become a powerful symbol, whose influence has extended beyond the borders of her country. She has demonstrated that authentic democratic values ​​and decency can defeat populism and hate speech. Madam President Čaputová will have the chance to convince the anti-establishment voter that she is a viable alternative to the current, corrupt political system. If she succeeds, Slovakia could become a beacon of democracy for the entire Visegrad region. She will bear on her shoulders a responsibility greater than that of any other head of state in the surrounding area. She will be under an amount of pressure that presidents of smaller countries cannot even imagine. The reason for this is simple: She cannot afford to make even the slightest stumble, because “living symbols” are never forgiven. However, it would be wise for her constituency to remember that at the beginning of every frustration there is always an unrealistic expectation. “Our Zuzana” is made of flesh and blood. If her supporters create a cult of personality around her, they are sure to be disappointed in the end. Čaputová is not a political prophet who can perform miracles. She is just a human being in a very difficult position. Slovak journalist and political commentator, since 2019 he is a director o Investigative Center of Ján Kuciak. Based in Bratislava.